Tirol’s biggest lake and its five picturesque holiday towns provide a genuine holiday paradise in the summer. Tirol Sport- & Vitalpark is not just a paradise for families, hikers and runners, water babies also get their money’s worth, as do nature-lovers, adventurers and those looking for peace and relaxation. It is the spectacular natural realm which makes the area around Achensee so special. As the biggest lake in Tirol, Achensee is also a refuge for lots of sailors, surfers and kite-surfers. In summer they gather with sun-worshippers, who are keen to take a dip and not only enjoy the breath-taking views in the region’s bathing lakes, but also the pure water in Achensee. The lake is surrounded by two mountain ranges – on one side the Karwendel mountains rise up with their rugged rocky peaks, while on the other side chamois and Golden Eagles greet you from the summits of the Rofan mountains. This gem of a place captivates with its gentle Alpine pastures, as much as it does with its precipitous rocky cliff faces. This means that Achensee is the perfect starting point for hikes, mountain bike tours and climbing adventures. More than 450 kilometres of signposted hiking trails, 250 kilometres cycle routes and 183 kilometres signposted running routes are available for you in Achensee. The outdoor offer is completed with several via ferratas and also by E-Bikes, which can be hired and recharged in all towns. There are also several opportunities to play tennis in the region, and to have a lovely experience riding on the back of a horse, or in a horse-drawn carriage. Achensee is also home to many Tirolean and also international golfers. With two very well-tended golf coursesand some international events, the region has long made a name for itself on the golf scene. The region is therefore a sanctuary for anyone who wants to get active and recuperate from the stresses of day-to-day life. On the following pages you can read about and get information on everything Achensee has to offer in summer! Set in the midst of a breathtaking natural backdrop, the region of Achensee is alluring in winter too with its wide ranging, top-quality holiday offers. Families in particular really get their money’s worth when it comes to skiing. The region has long made its mark on Nordic athletes as being a top cross-country hub. The unique landscape at Tirol’s biggest lake speaks for itself – snow-covered peaks, five picturesque villages and a glistening white landscape, which promises pure winter magic. Coupled with perfect activities on offer for your holiday, from cross-country to skiing, touring, winter hikes through to new trendy sports such as snowkiting and paragliding in winter, a holiday at Achensee provides everything you need to set your heart aflutter. The region is known in particular for its extensive cross-country offers. With more than 200 kilometres of separate slopes for classic cross-country skiers and skaters, its own practice slope, barrier-free cross-country skiing and snow-making facilities in several holiday towns, Achensee maintains its pioneering role in all matters cross-country skiing in Tirol. 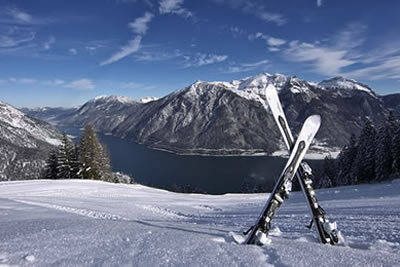 The Achensee region provides a total of four ski areas and two small practise hills with around 53 kilometres of pistes. These areas are, in the first instance, known for their considerable family friendly attitudes and special range on offer for ski munchkins. Those of you who would like to investigate the winter wonderland on Achensee away from the piste can let off steam on the five toboggan runs or relax during a horse-drawn carriage ride in one of the Karwendel valleys.